Karns may, at its discretion terminate, alter, limit, or modify the Karns Fresh Rewards program including rules, regulations, terms & conditions, or benefits at any time without notice. Karns Fresh Rewards members are eligible to receive discounts, coupons, and other special benefits when presenting their card at time of purchase. The Karns Fresh Rewards Card is not necessary for advertised sale prices unless notated. No purchase is necessary to receive The Karns Fresh Rewards. Purchases of beer, wine, tobacco, MoneyGram, money orders, utility payments, postage, gift cards, lottery, Ticketmaster, Western Union and other items prohibited by law are not eligible toward rewards. Program benefits are unique, account-specific, and nontransferable. Any rewards lost or stolen will not be replaced or reissued. Karns Fresh Rewards Card must be presented at the time of purchase. Privacy is paramount, and we will never sell, share, or convey your information to anyone. 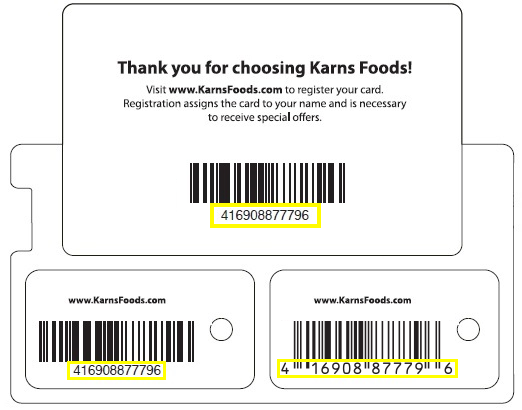 Your information is solely used for rewarding you with customized coupons, offers, personalized content and store promotions from Karns.